During the long eighteenth century the moral and socio-political dimensions of family life and gender were hotly debated by intellectuals across Europe. John Millar, a Scottish law professor and philosopher, was a pioneer in making gendered and familial practice a critical parameter of cultural difference. His work was widely disseminated at home and abroad, translated into French and German and closely read by philosophers such as Denis Diderot and Johann Gottfried Herder. 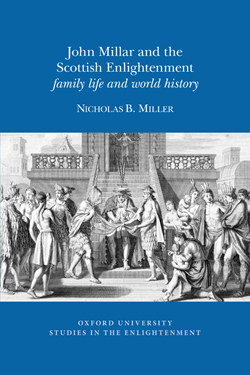 Taking Millar’s writings as his basis, Nicholas B. Miller explores the role of the family in Scottish Enlightenment political thought and traces its wider resonances across the Enlightenment world. John Millar’s organisation of cultural, gendered and social difference into a progressive narrative of authority relations provided the first extended world history of the family. Over five chapters that address the historical and comparative models developed by the thinker, Nicholas B. Miller examines contemporary responses and Enlightenment-era debates on polygamy, matriarchy, the Amazon legend, changes in national character and the possible futures of the family in commercial society. He traces how Enlightenment thinkers developed new standards of evidence and crafted new understandings of historical time in order to tackle the global diversity of family life and gender practice. By reconstituting these theories and discussions, Nicholas B. Miller uncovers hitherto unexplored aspects of the Scottish contribution to European debates on the role of the family in history, society and politics.